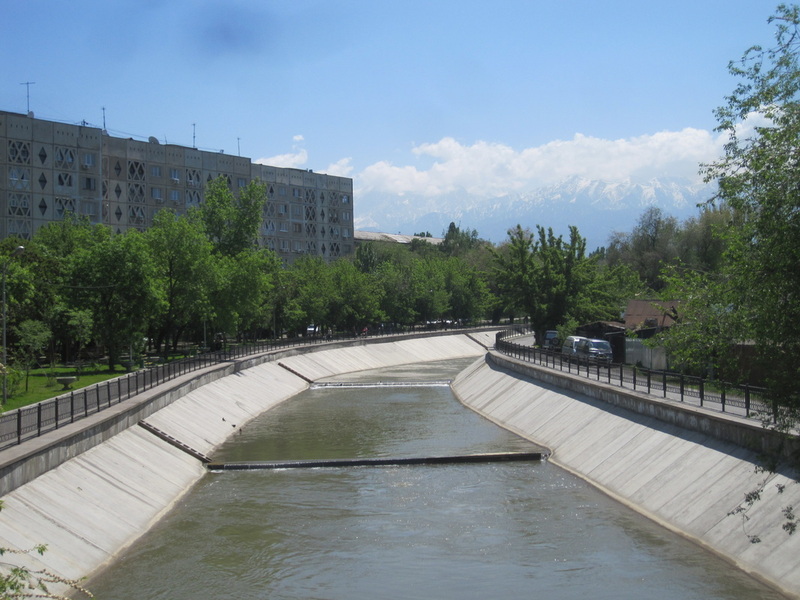 Almaty is in a part of Kazakhstan that's long been known as Semirechye [Семиречье], or the Land of the Seven Rivers. 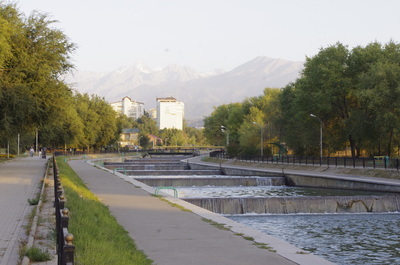 It sits below the grand Zailisky Alatau mountains, a wonderland of mountain streams. 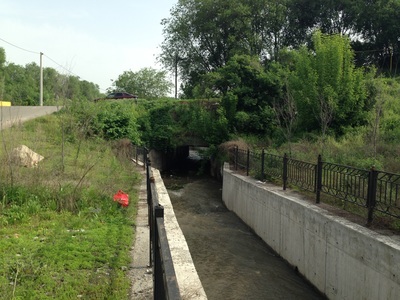 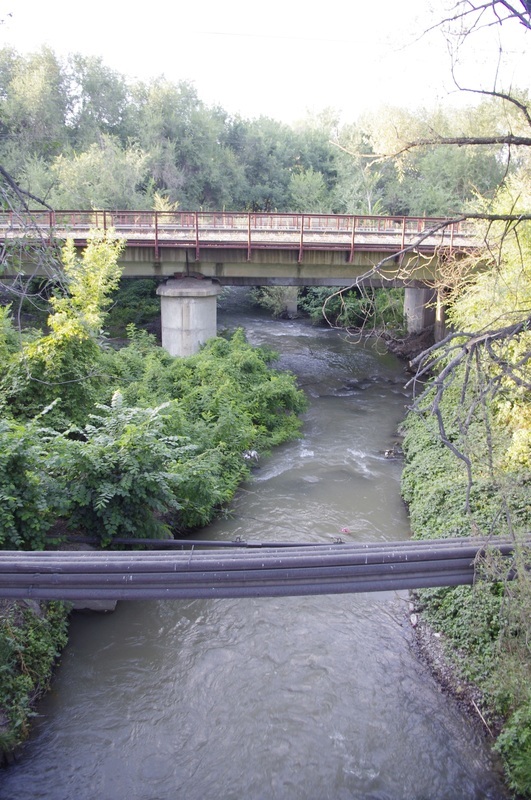 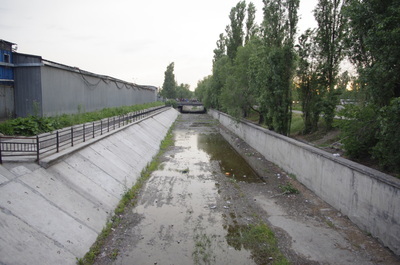 Yet the city itself is not known for its waterways, because a large portion of local creeks have been coated in concrete, effectively transforming them into dreary canals. 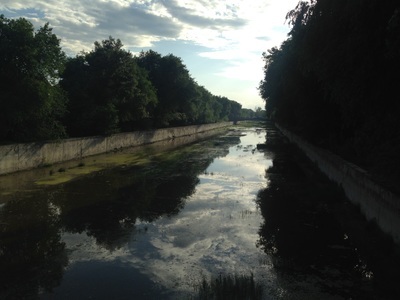 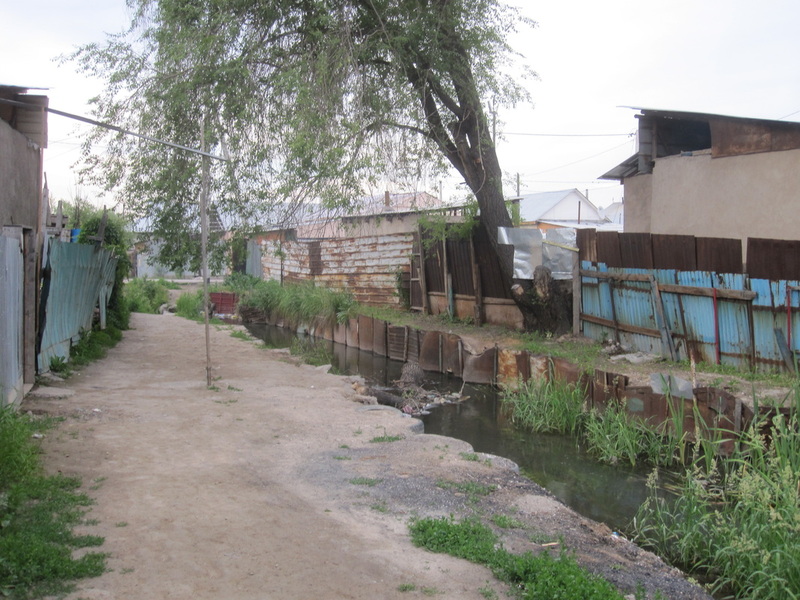 It was the bounty of rivers like the Small Almaty that led Russian settlers to build a city here in the first place. 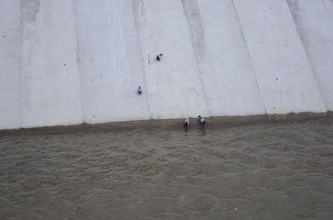 So why was this water caged in? 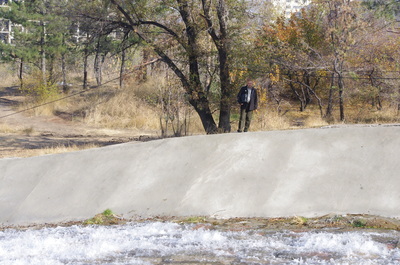 The concrete came because of the danger of syel's [сель]. 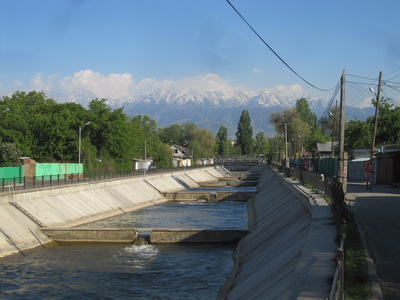 A syel' is a devastating mudflow that happens often in the region when warm weather melts mountain glaciers, creating a flow of water that can burst through natural dams made of moraine, or glacial debris. 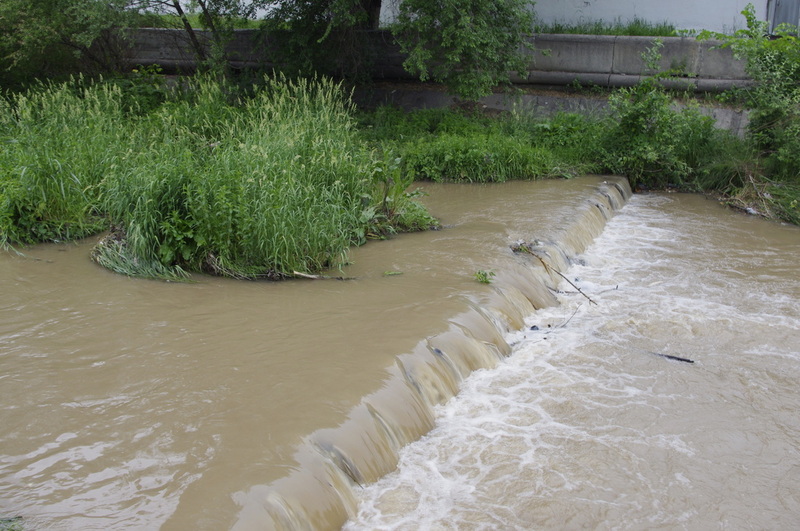 The built-up water and moraine rushes through the narrow mountain valleys, collecting more boulders and debris, and this avalanche of liquid earth has the ability to destroy the city below. It nearly did already — twice. 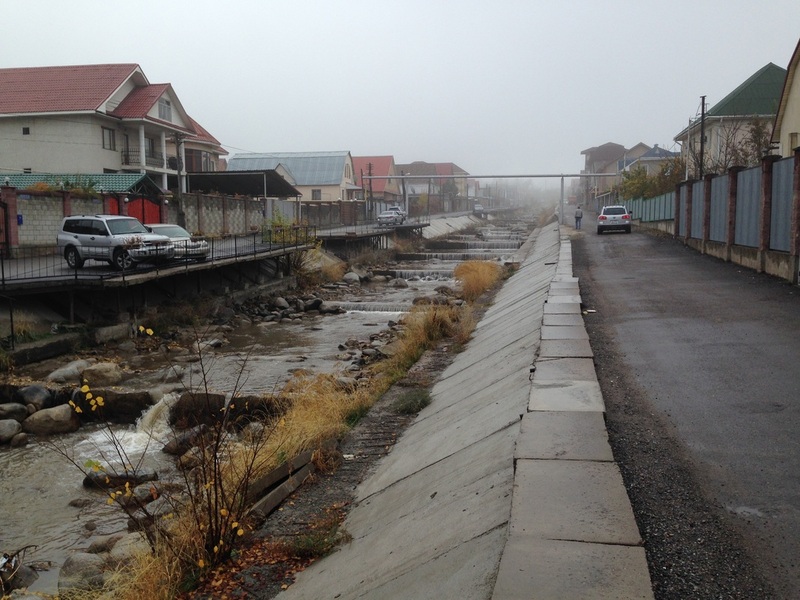 In 1921, a mudflow devastated the city of Alma-Ata, strewing boulders throughout the city streets, where some still remain today. 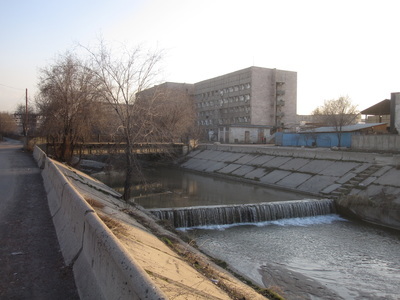 In the 1960s Soviet engineers, realizing the potential danger of another syel', used a massive explosion to make an earth-fill dam that would stand in the path of any future flows. In 1973, the second syel' came, and the dam saved the city. "A diagram of Alma-Ata's defense against mudflows." 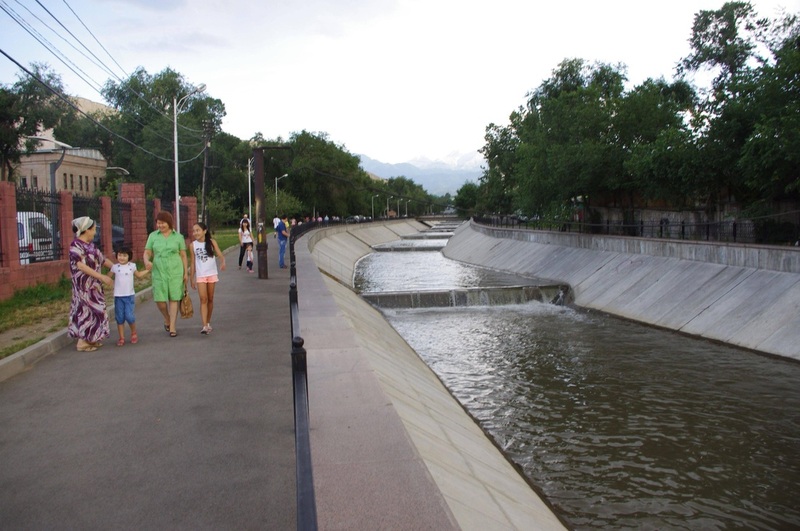 In the years that followed, an ambitious anti-mudflow system was put in place throughout the city by the Kazakh instititute of Gidroproekt. 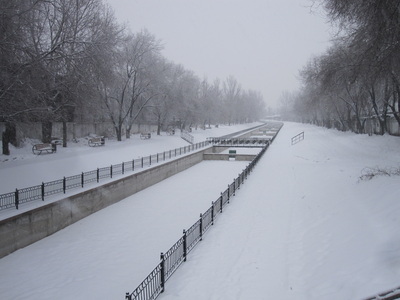 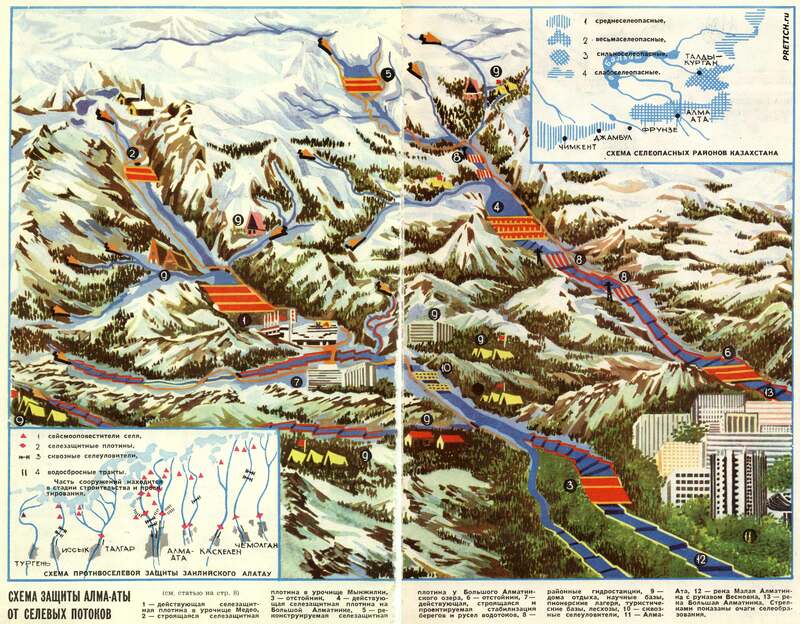 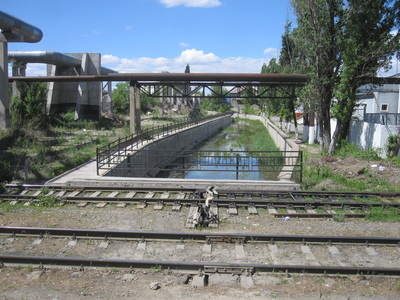 The three major river systems in Almaty were all reinforced with concrete embankments: the Small Almaty River, the Big Almaty River, and the Vesnovka River, called Yesentai in Kazakh (later the Pramukha and Kargalinka tributaries were also partially canalized). The new canals were characterized by their "cascades" (каскады; kaskady), a series of pools that flow into each other as gravity pulls the river down through the city. 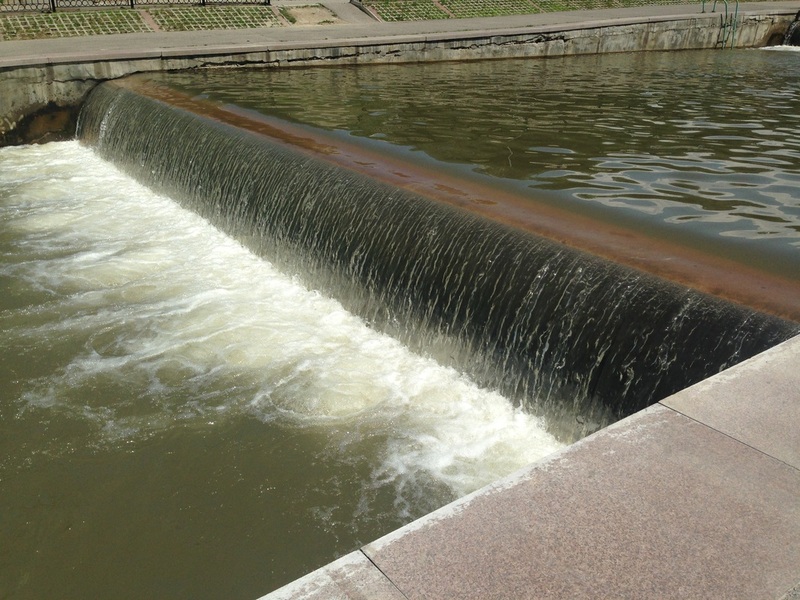 At each step in the cascade, a barrier called a weir (водослив; vodosliv) slows the kinetic force of the river and any potential flood. 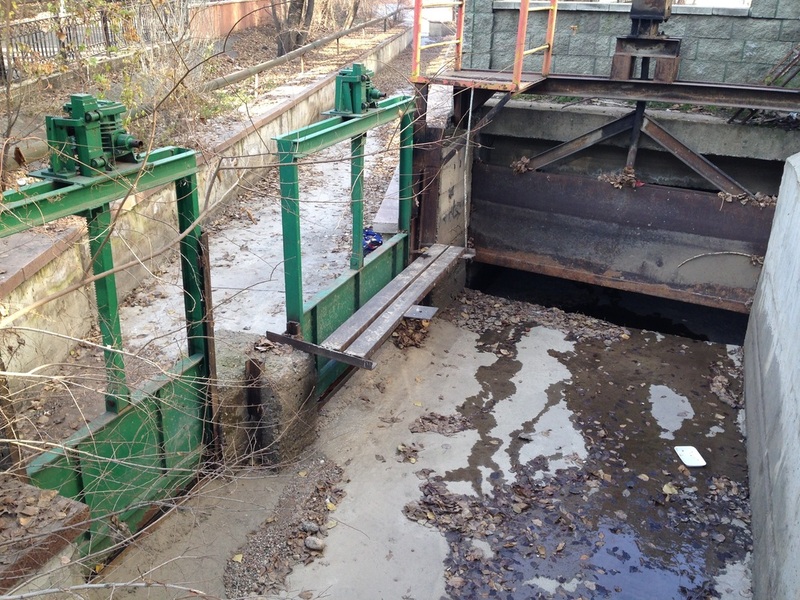 Water flows over these weirs or through retractable openings called sluice gates (щитовый затвор; schitovy zatvor) that allow further control of the flow. 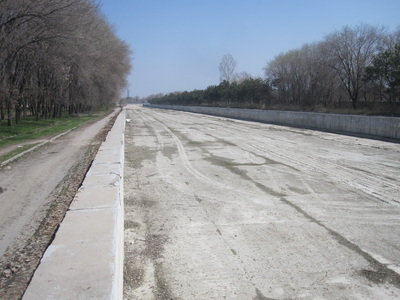 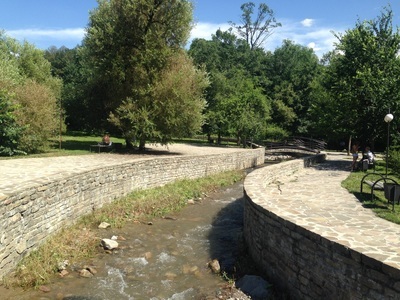 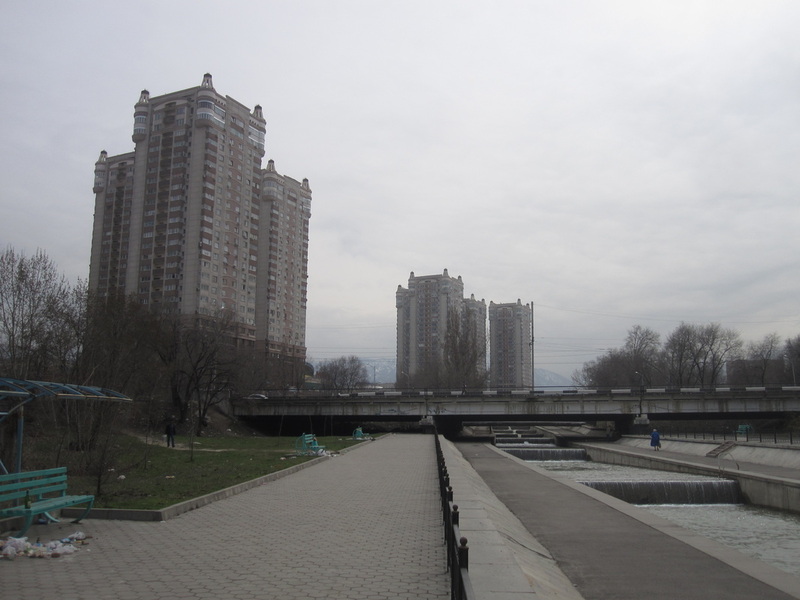 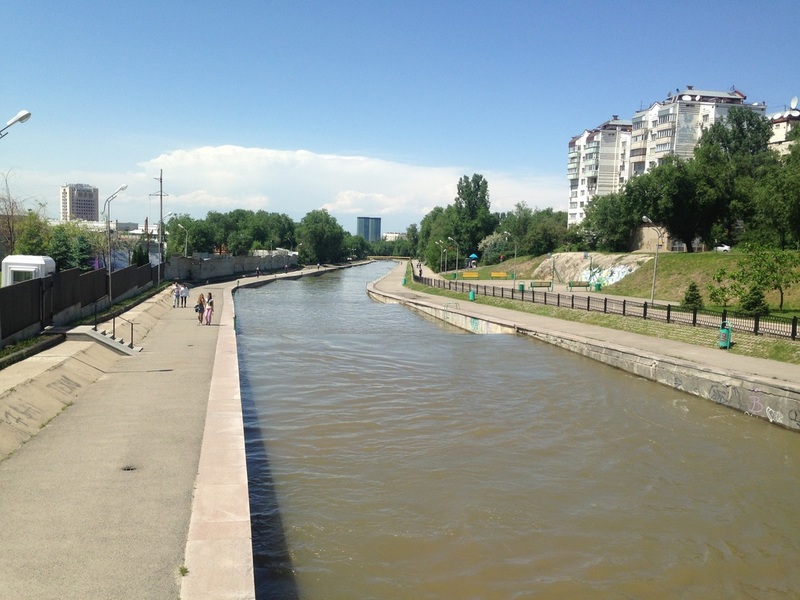 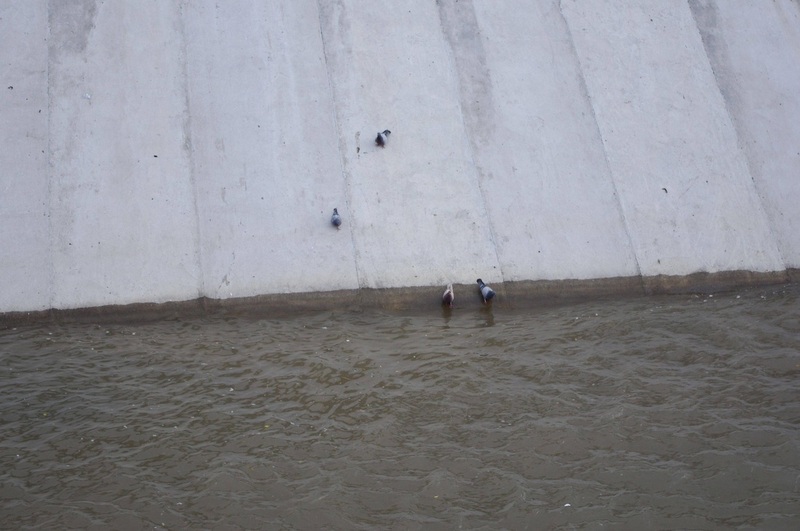 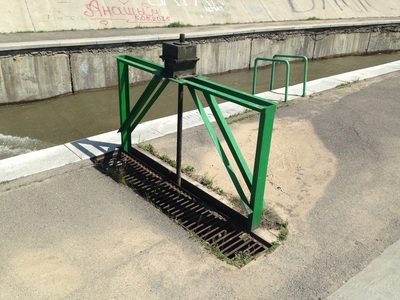 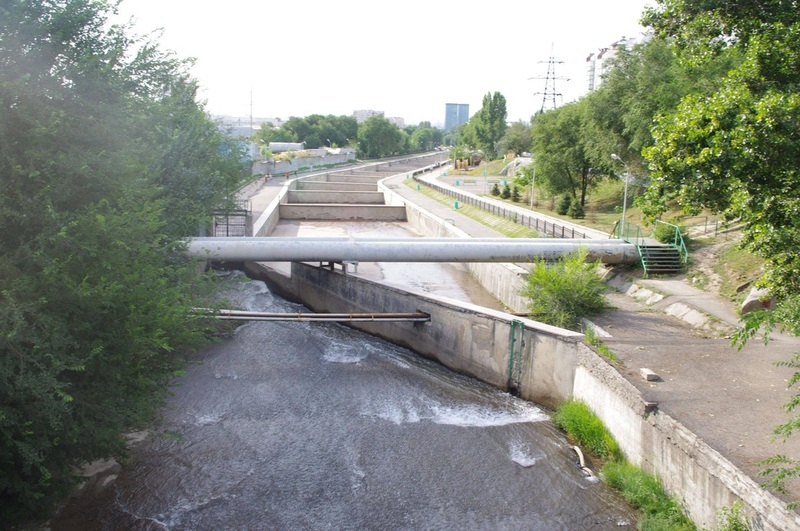 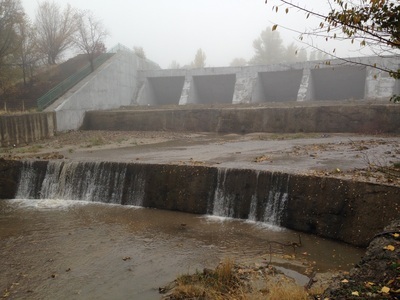 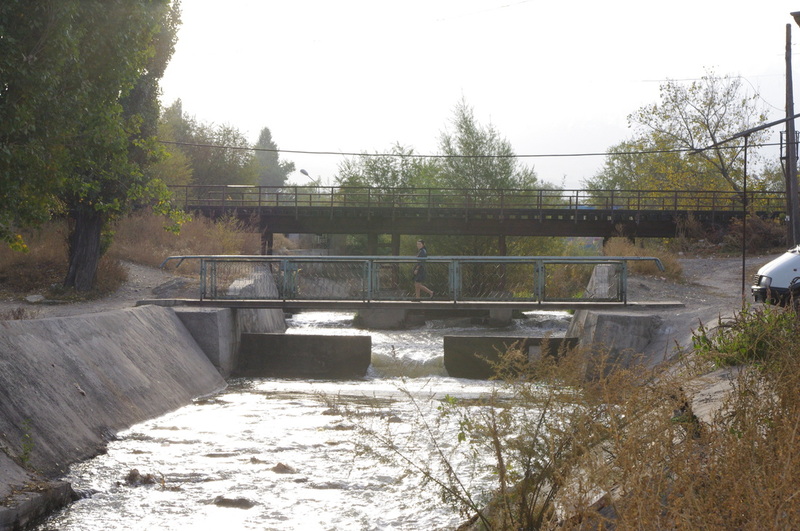 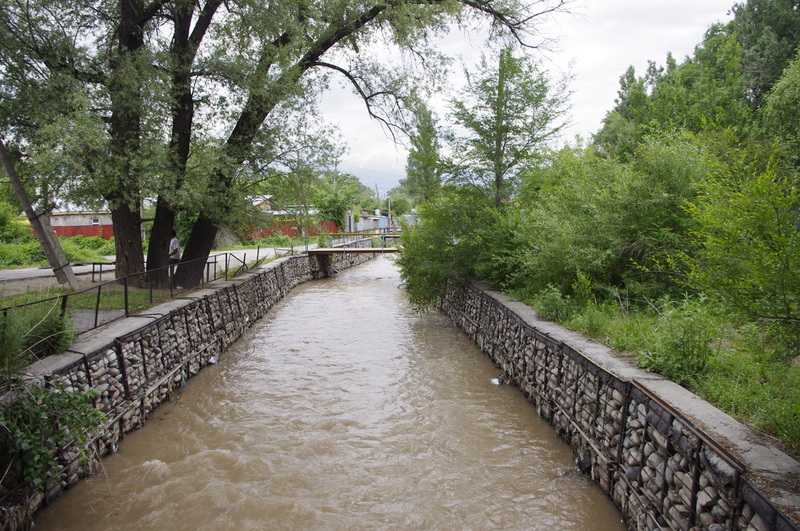 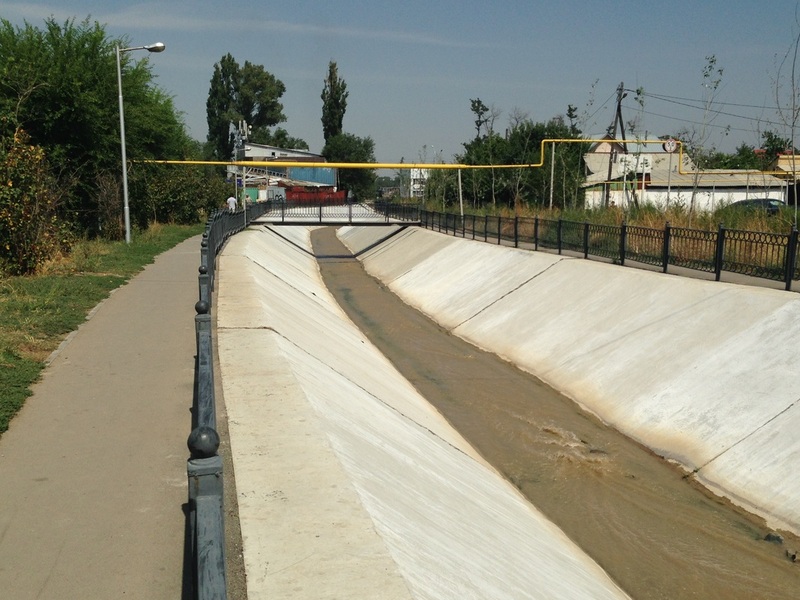 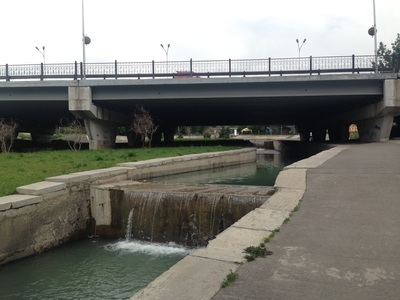 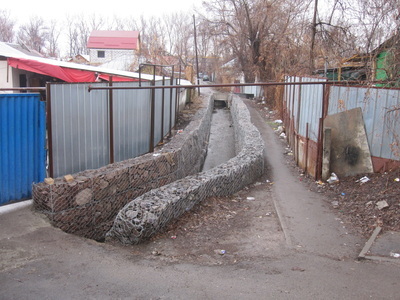 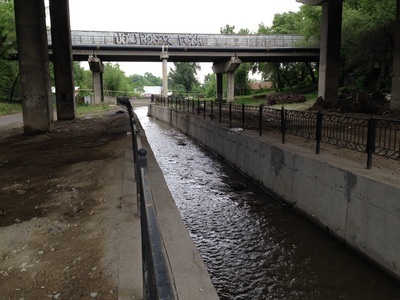 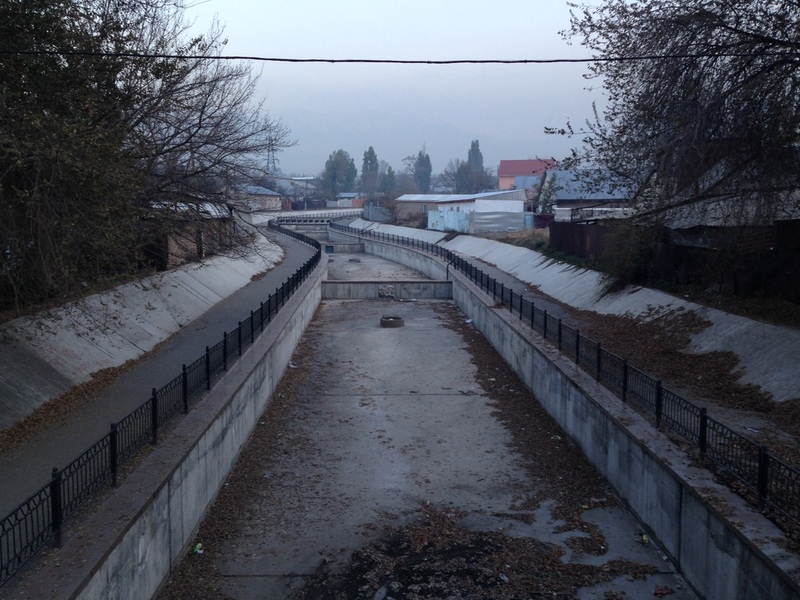 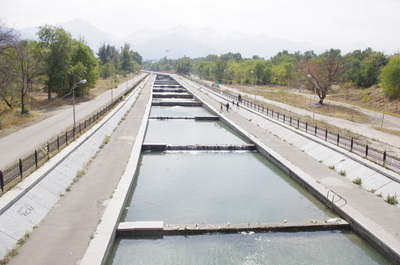 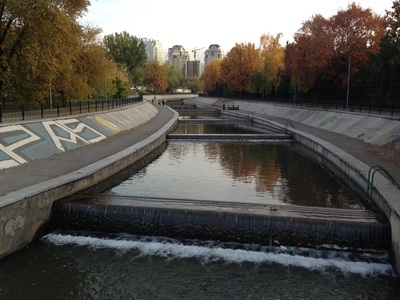 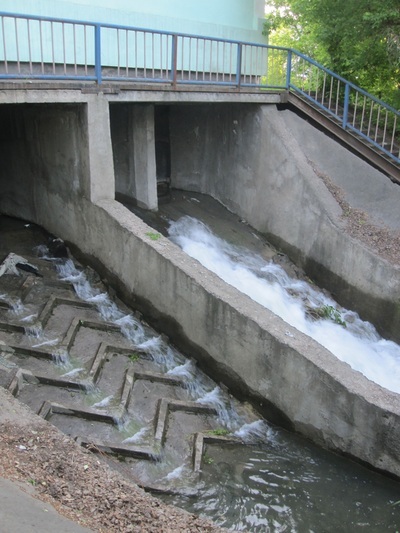 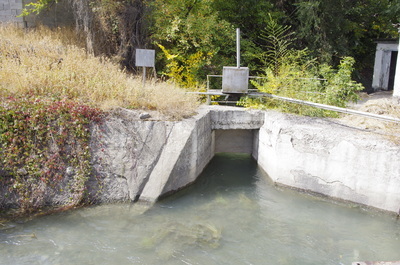 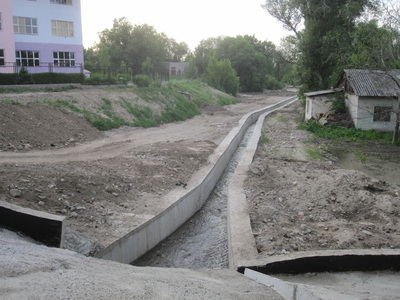 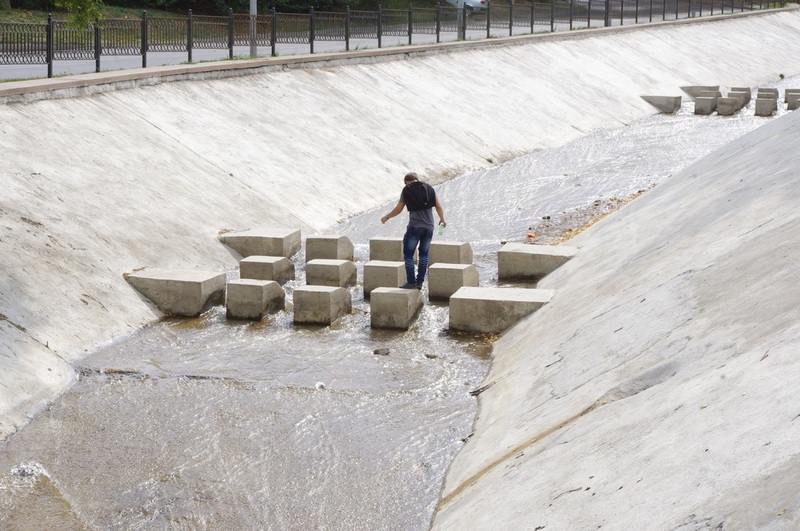 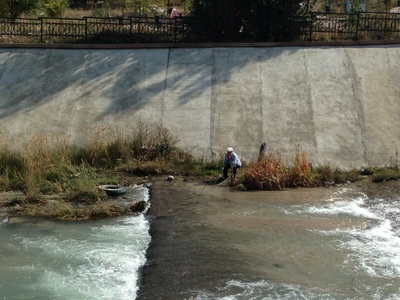 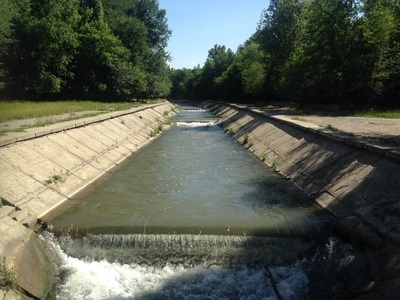 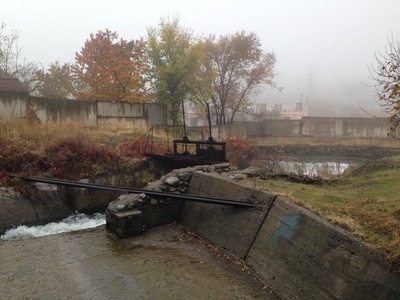 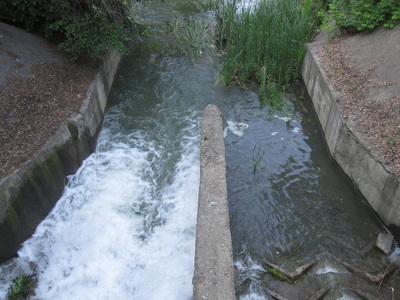 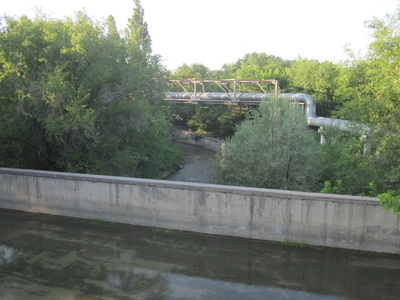 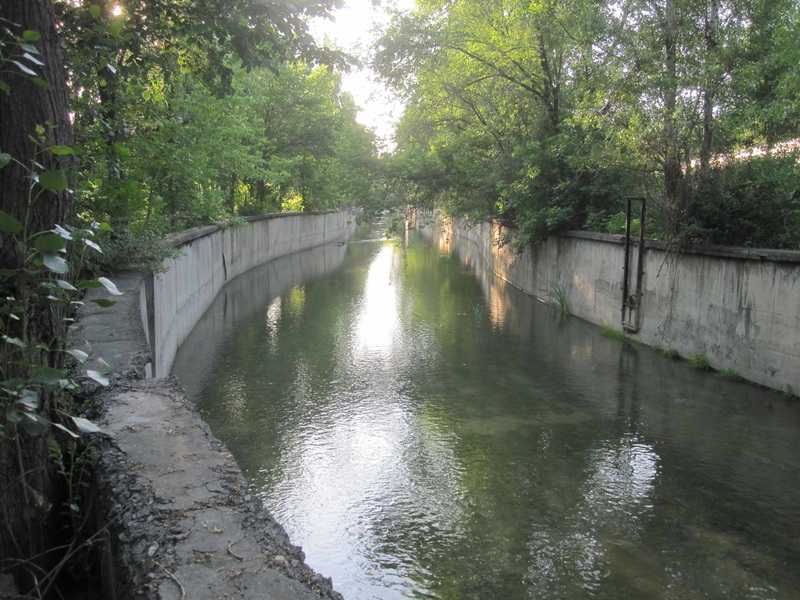 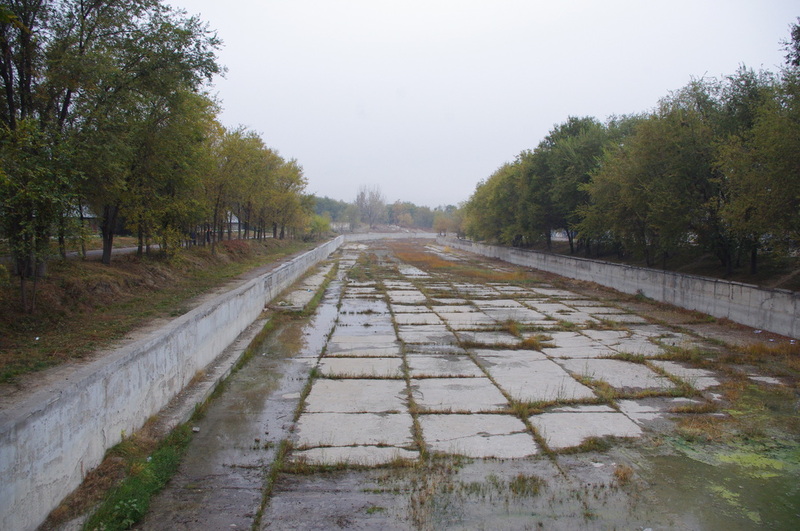 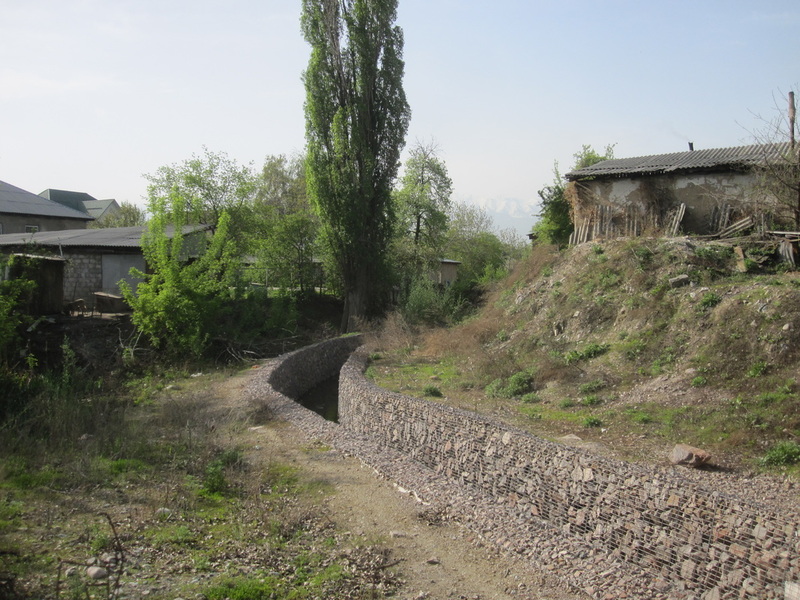 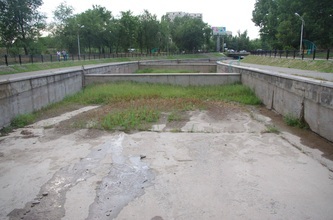 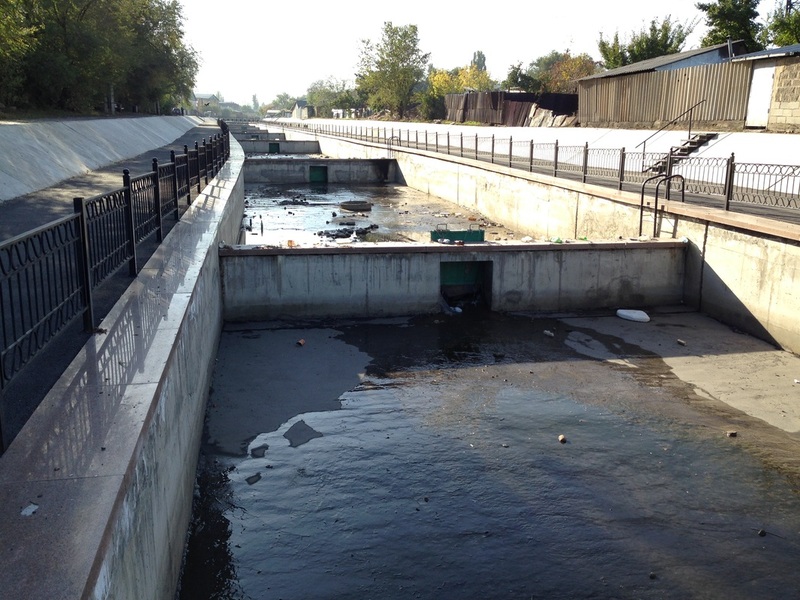 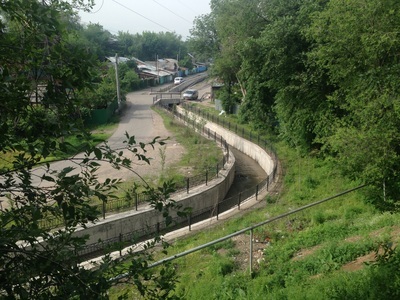 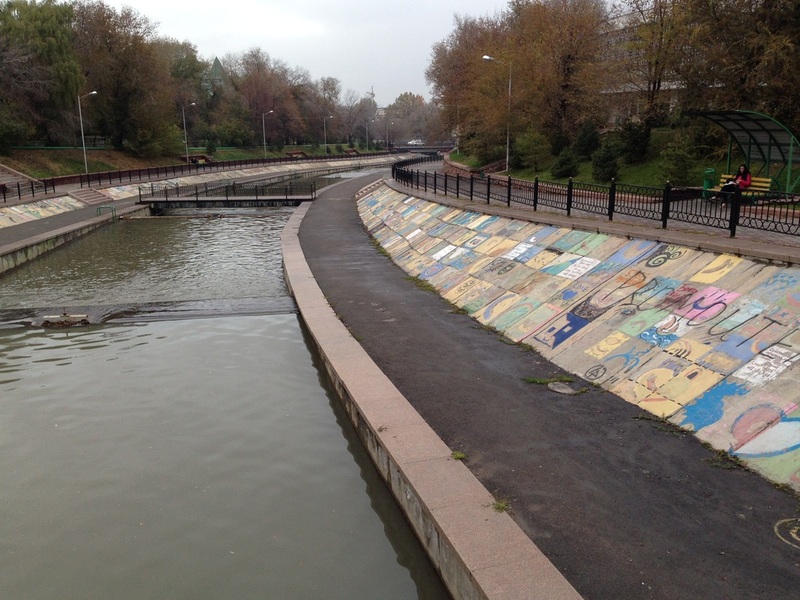 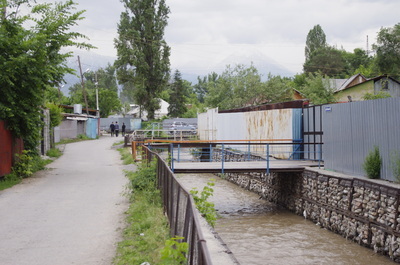 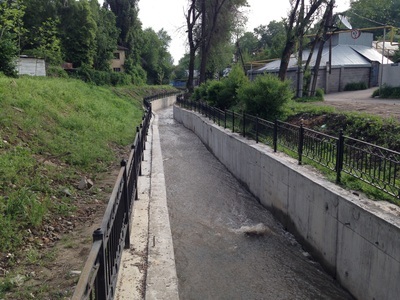 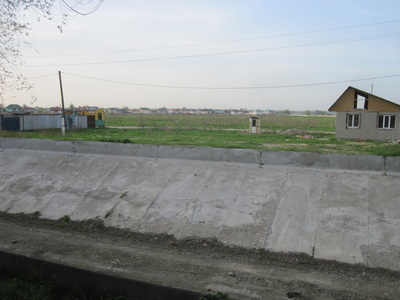 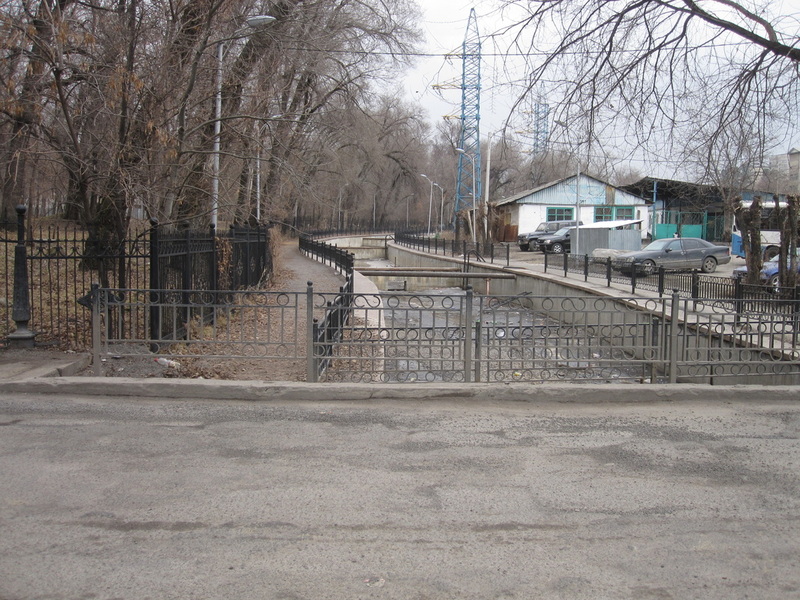 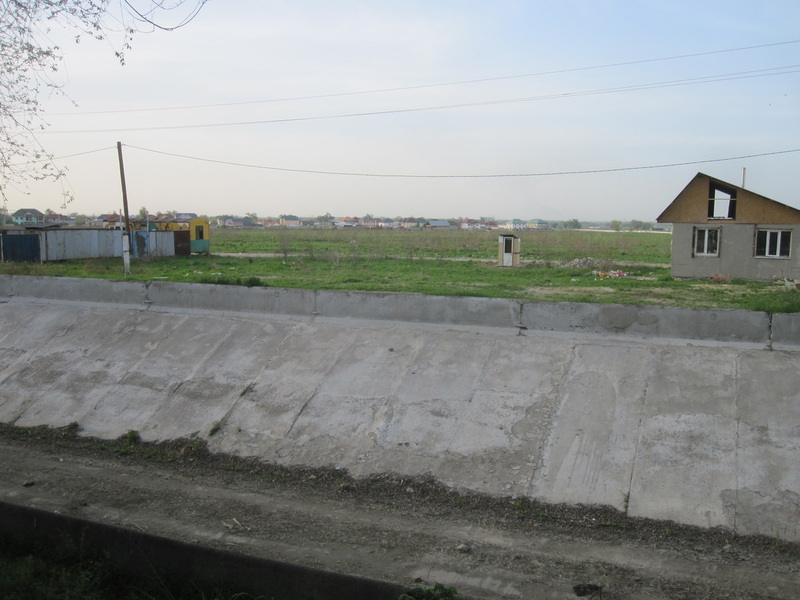 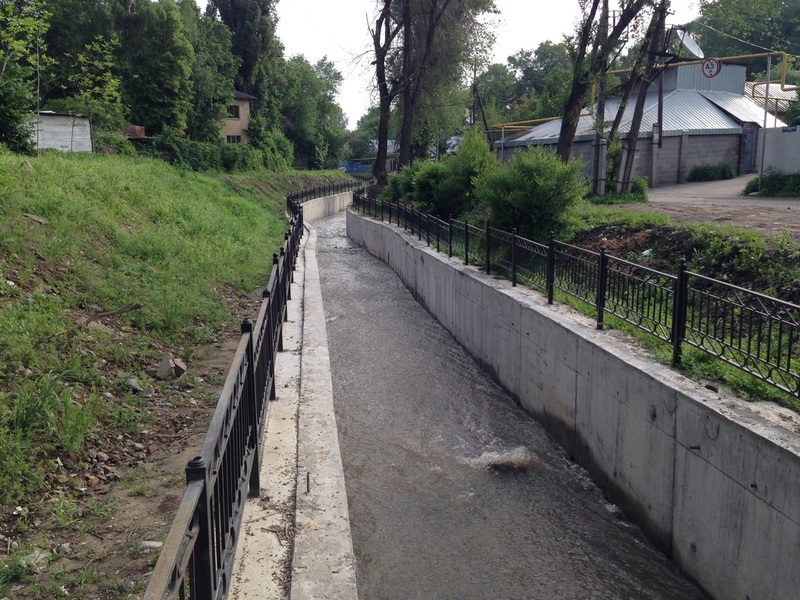 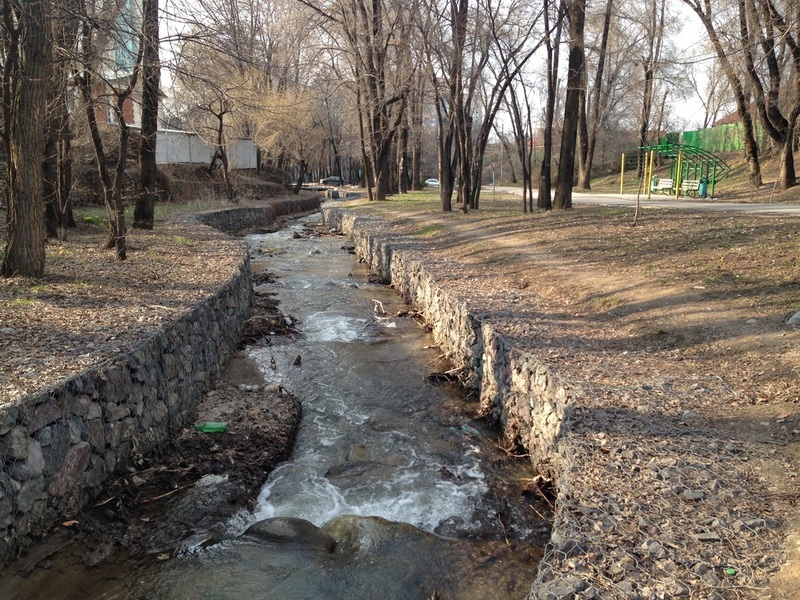 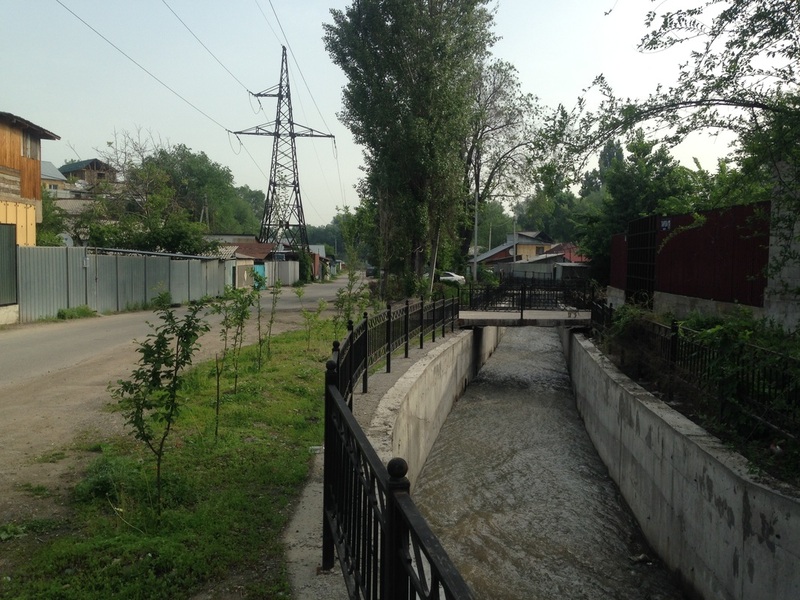 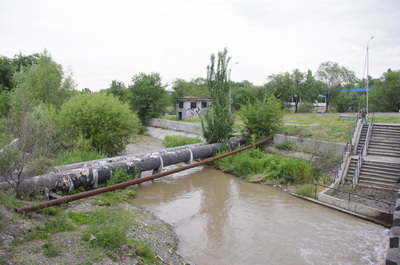 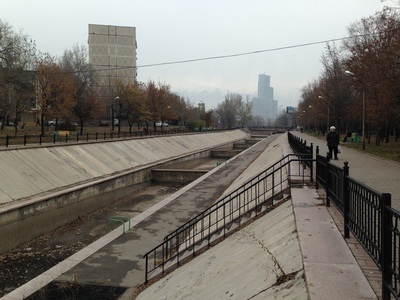 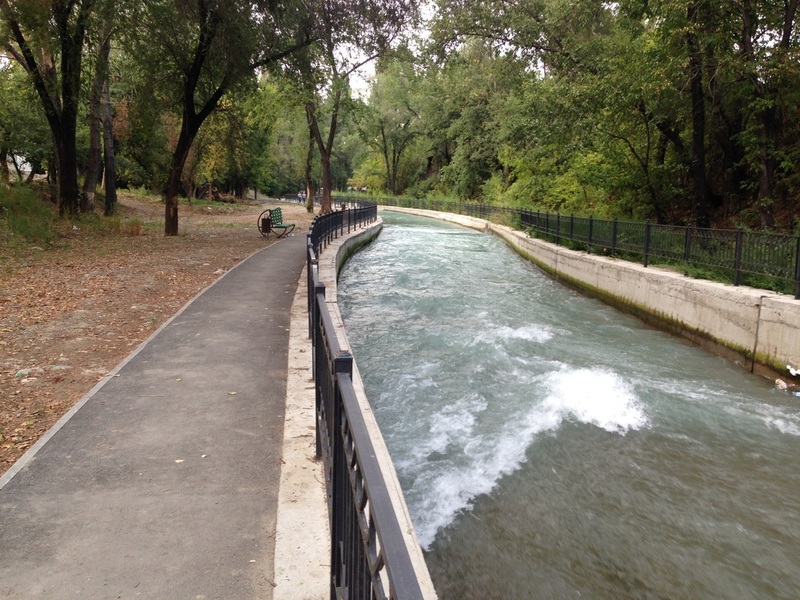 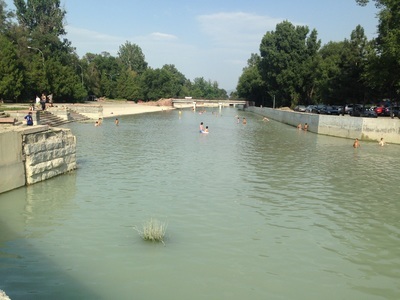 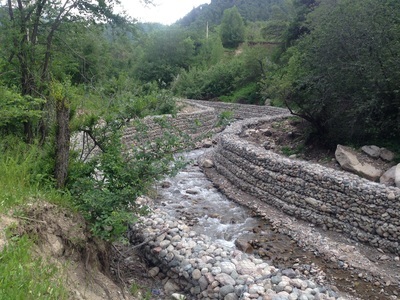 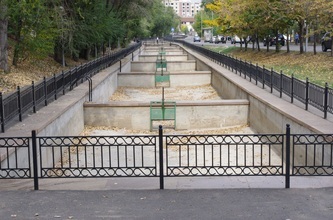 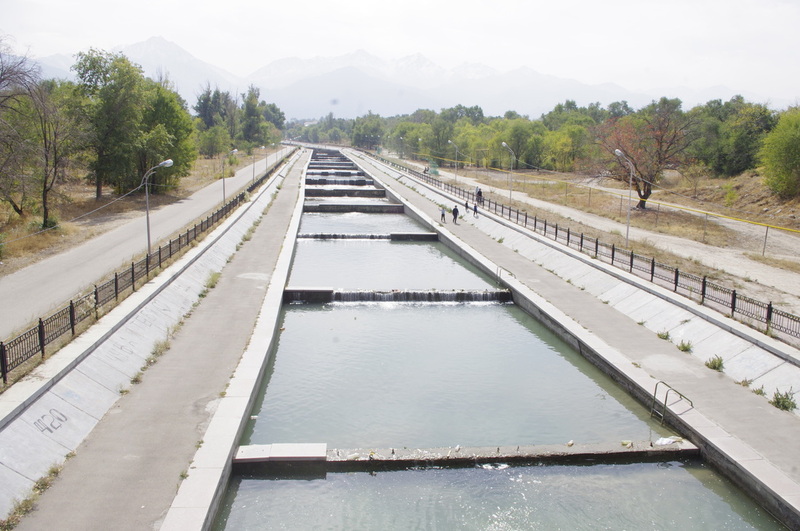 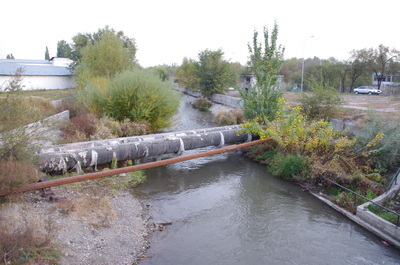 As one more barrier to the flow of the water, concrete teeth called baffle blocks have even been installed at one stage of the Small Almaty River. Continuing the military imagery of a defense against nature's wrath, these blocks are often compared to dragon's teeth, pyramids of concrete that were used to halt tank advances during WWII. 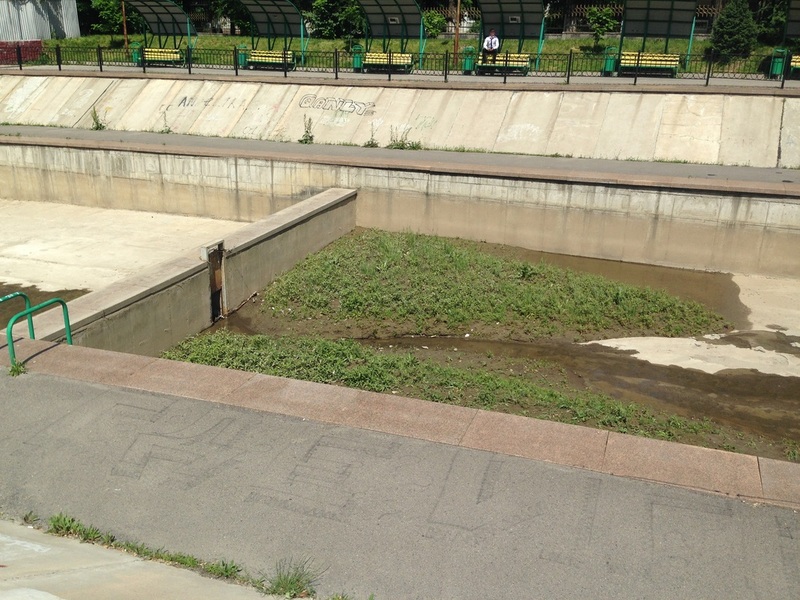 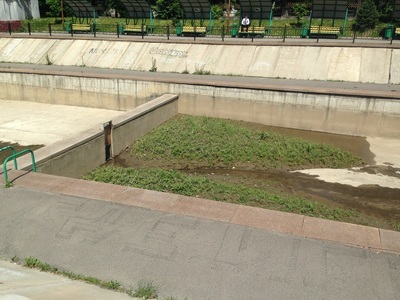 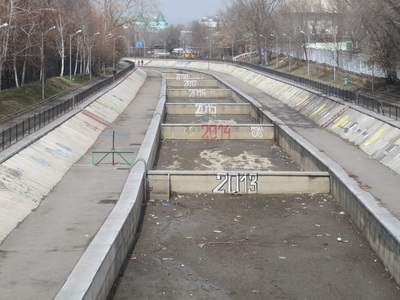 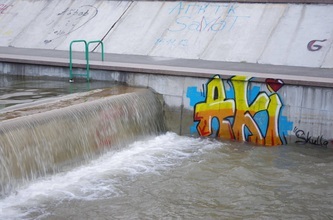 In times past, the concrete embankments along Almaty's rivers were run over with weeds and covered in graffiti, and thus weren't the most family-friendly of public spaces. 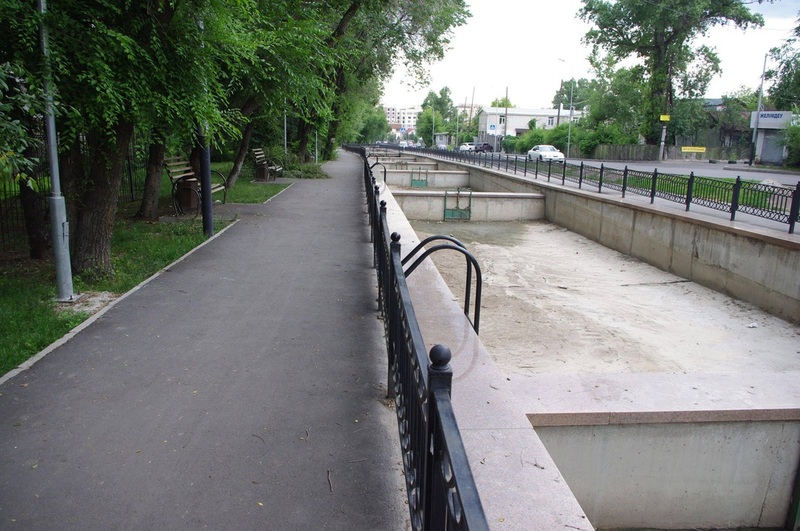 These days, they've been revived with benches, gazebos, and little parks. 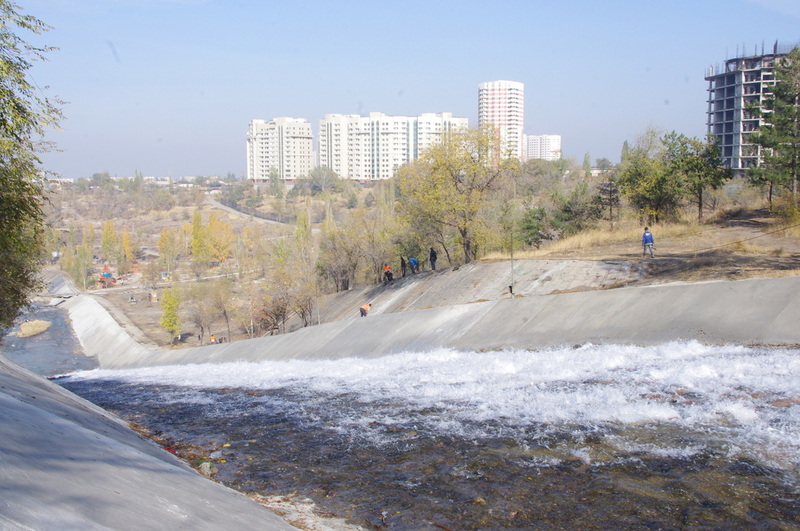 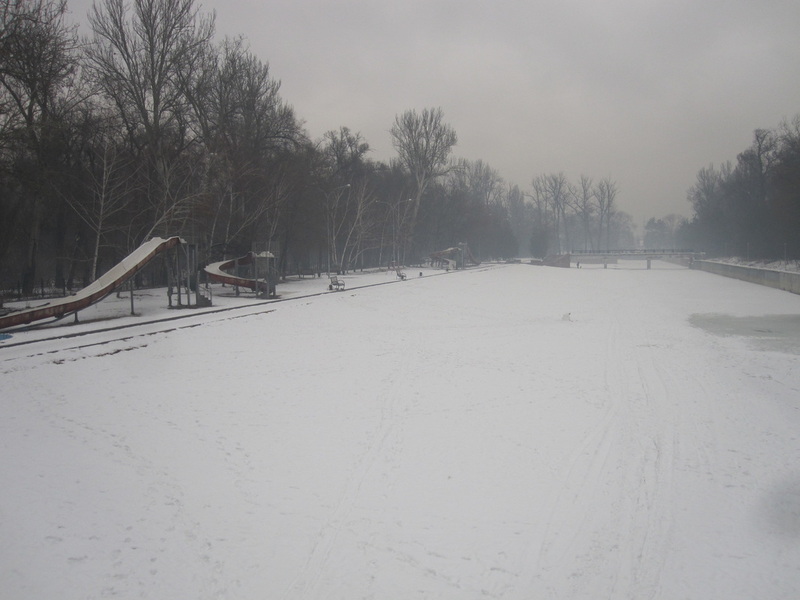 One particularly nice stretch along the Vesnovka is called the Khamit Yergaliev Embankment, and one can find strolling couples here any time of the year. 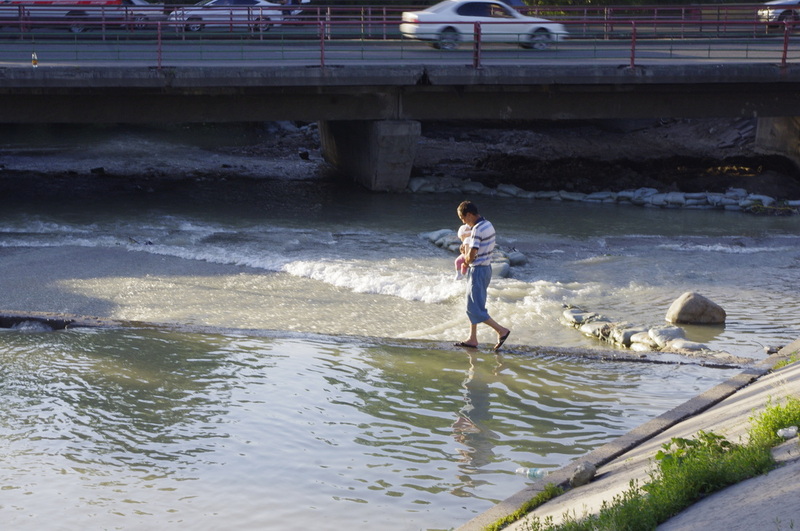 The water level fluctuates throughout the year, so there are times when the canals have just a trickle of water running through their concrete chambers, but in the spring, when rock flour colors the glacial melt turquoise, Almaty's rivers are a wonderfully romantic place to walk.